Recently I had the pleasure of attending Rock N Roll Fantasy Camp, a four- to five-day rock camp for old musicians or wannabes to jam, form a band, practice and play with rock stars from the 70s, 80s, and 90s. Since the last time I played keyboards in a band was back in college, 30 years ago, I was excited to not only see if I could remember how to play, but to find out what makes rock stars different from other less-successful musicians. As I got to know the rockers and talk with them about the secrets to their success, I realized that brands and CMOs could leverage many "rock star" strategies to improve customer engagement, motivate their teams, and lead the growth agenda for their companies. At one point during the camp, Steve Stevens, lead guitarist for Billy Idol and other great bands, broke down verse-by-verse the guitar parts for their big hit "White Wedding." Each section of the song was analyzed to determine the best guitar style to make the song more impactful. As brands, how often do we take apart each piece of a program or campaign and think about the best way to engage customers or build the brand piece-by-piece? Think of the best approach to tell your brand story at every touch point with your customers? Analyze and review each piece and timing of each piece within your branding efforts? I was fortunate to have Warren Hayes, lead guitarist for The Allman Brothers Band, stop by our band's practice room to jam with us and share a few stories. He shared his approach and passion for practicing every day, which many times means literally picking two notes and practicing only them for two hours. I was always under the impression that the great rock bands were just gifted musicians that "winged it" in the recording studio and at concerts. This is not the case. How much time and effort are you and your team spending staying sharp and continuing to improve as marketers and leaders? Just as hours of practice and focus separate the good from the great musicians and bands, a commitment to constant improvement defines the best marketing teams as well. Toward the end of rock camp, our band went to local recording studio in LA and had a chance to record our original song with a recording expert. I was impressed by the way the studio experts were able to break out each instrument, extract the best sections, and then have a certain musician re-record their part for a specific section -- all of which resulted in the best possible final recording that ultimately is shared with music fans. Intrigued, I thought about how CMOs act as that "studio mixer," pulling all the components and team roles together to put out the best possible program, campaign or event. How often do you ask someone to share their specific role with the rest of the team, provide feedback, then try it again and again? Manage and change the "volume" of each piece of a campaign on customer engagement program instead of all campaign vehicles on full volume? In an interesting conversation with one of the rock stars about groupies, he told me, "Sometimes you just need to give them what they want to keep them excited to be your groupies and help sell the band." Think of your brand advocates as groupies, and instead of taking them for granted, give them what they want: early views of new products, special services, and personalized feedback. And don't forget to simply thank them and told them how much you love them. I was surprised to hear how many hours a day many of the rock stars at the camp practiced other genres. Hearing the drummer from Guns 'n' Roses or lead guitarist from Kiss talk about the hours they spend playing jazz, blues, and classical to improve as musicians and make their own music even better is also a great idea for marketers. Look at ideas from other industries and other marketing vehicles not commonly used in your industry to break through the clutter and engage your customers in new ways. Fresh ideas and big results can come from unexpected places and broaden your teams'. How Many Great "Studio Marketers" Do You Have? Throughout the camp the rock stars spoke with admiration about a great studio drummer, or bass player or keyboard player that performed with their bands on records and tours. I was surprised to hear that and expanded my thinking to our marketing teams. Obviously we need our lead singers/storytellers but there's also a role for "studio marketers" -- the best in the industry -- for specific areas across all brand programs, campaigns and events. Have these seasoned "studio marketers" work closely with your lead storytellers. I asked a number of rock stars what they missed most from their biggest rock star days, and almost everyone talked about the "tightness and feeling of family" during and right after a great performance. One star said, "Having a packed house of fans screaming and begging for more makes all the hard work worth it." As CMOs and marketing leaders, treat your programs and campaigns like live performances and allow your teams celebrate and feel the "rush" of success. While it's easy in this day of "what did you do for me today" to lose sight of the group, don't underestimate the power and inspirational value of creating a band-worthy team environment. Keep Playing the Hits, and Use Them to Introduce New "Songs"
One rock star told me right before our live performance at The Whisky A-Go-Go, "We get fans to concerts with our big hits, then introduce them to new songs once we get them there." This is an interesting approach for CMOs and brands to consider. Don't replace a successful program or message with the new version too quickly. Brand messaging consistency matters, and once brands have customers' attention and interest, they can begin a slow release of new "songs." As I look back on my five days of rock star glory and all that I learned from rock stars, I've not only come away as a better keyboard player, but a better marketer and CMO. Now I can say, "... and then one time at band camp" with confidence, pride, and a new respect for brand advice from rock stars. When David Fishof launched the first Rock 'n' Roll Fantasy Camp in Florida in 1997, the event lost so much money that he scrapped the entire plan. But several years later he found out that his dream to bring a taste of the rock 'n' roll life to the general public wasn't the failure he thought it was. Everything Fishof has learned from the rock 'n' roll world is in his latest book, "Rock Your Business: What You And Your Company Can Learn From The Business Of Rock And Roll" to help future entrepreneurs make their own ideas a reality. Fishof previously told Pollstar his decision to publish the book, co-written with New York Times best-selling author Michael Levin, was sparked by conversations with attendees at his Rock 'n' Roll Fantasy Camp and their rock-star mentors. A shift in how the general public perceives music industry careers was another catalyst. "I've seen the success of these bands and they really work together," he told Pollstar. "I learned to be creative because I respect the artists who write songs. [From] the way they collaborate on music, I learned to collaborate with promoters, sponsors and talent." And the results of the strategy he shares in his book are seen in real life. Since re-launching the camp in 2002, the brand has expanded to include a corporate version of the camp, a VH1 Classic reality show and a permanent home at the MGM Grand Hotel & Casino in Las Vegas. "I've had failures. I've had successes. You've got to take them all," Fishof said. "It's about not having the fear of doing something." 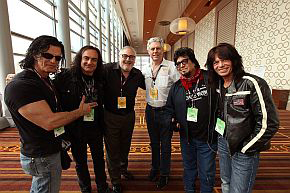 And the fantasy camp's success relies on the participation of rock stars like panelists Teddy Andreadis, Vinny Appice, Kane Roberts and Rudy Sarzo. The musicians, whose collective resumes include playing with acts such as Black Sabbath, Dio, Quiet Riot, Alice Cooper, Yngwie Malmsteen and Carole King, stay involved with the camps around their tour schedules. All agreed that mentoring rocker hopefuls from all walks of life enhances their own lives. "It's such a blast to play with people who have never had the chance to play before," Sarzo said. "Every time we start a new camp, we have a new band so it's really an incredible experience." Roberts said, "The thing that struck me ... at my first camp, my first band was essentially made up of four or five executives. They had left their normal, number-crunching lives to access some kind of a dream. ... When they returned to their lives, they returned there with something more." "It's a really touching experience, also, for us counselors," Appice said. "It's sad toward the end [of a camp] for us, too. We go back to our daily lives, even though we play music." Andreadis said each camp is an adventure. "We never know what the level of talent will be," he said. "As counselors, we like to help the bands out, and we help each other out." As to the future of sharing the power of music through the Rock 'n' Roll Fantasy Camp, MGM Grand VP of Entertainment Mark Prows asked Fishof, "How is your company structured to where's there's longevity amid everything you've built over the years?" Fishof said that although he's not alone in the endeavor, how to carry on the legacy is a subject he thinks about every day. "I want to hand it over to [longtime camp counselor] Kip Winger, who's done an amazing job as MC, music director and overseeing production, and the guys who take leadership," he said. "It's been hard. I started off as a manager and a producer. I would sell the show and let CAA and William Morris book my shows, then sell to promoters. Now, I have to worry about marketing, promoting, Facebook, Twitter and Instagram... it's too much. The opportunity to be at the MGM Grand has really propelled me to find the right leader. I'm trying to convince Kip to move to Vegas. "After 16 years, we're ready to propel this to the next level."